This is a great warm weather salad as it can all be served room temperature. The avocado pesto is made without oil so it is a much lighter version than the traditional recipe. If you want to feed a crowd, double the recipe and fire up the grill to do the chicken, everything else can be prepared well ahead. On a parchment lined baking sheet toss the red peppers and onions with 1 tablespoon of olive oil and salt to taste. Spread them out in an even layer. Roast for about 30 minutes or until they are soft and spots are lightly browned. Combine the dressing ingredients in a jar with a tight lid and shake to combine. Toss the roasted vegetables, beans, and the flat leaf parsley with 3 tablespoons of dressing. Heat a sauté pan to medium high heat and add the 2 tablespoons of butter and oil and sauté the chicken breasts until just cooked through and lightly brown. About 3 minutes per side, but depends on how thin they are. Remove from the heat and allow them to rest and finish cooking. To serve, top the white bean salad with sliced chicken and a large spoonful of avocado pesto. Finish with a drizzle of the lemon dressing. 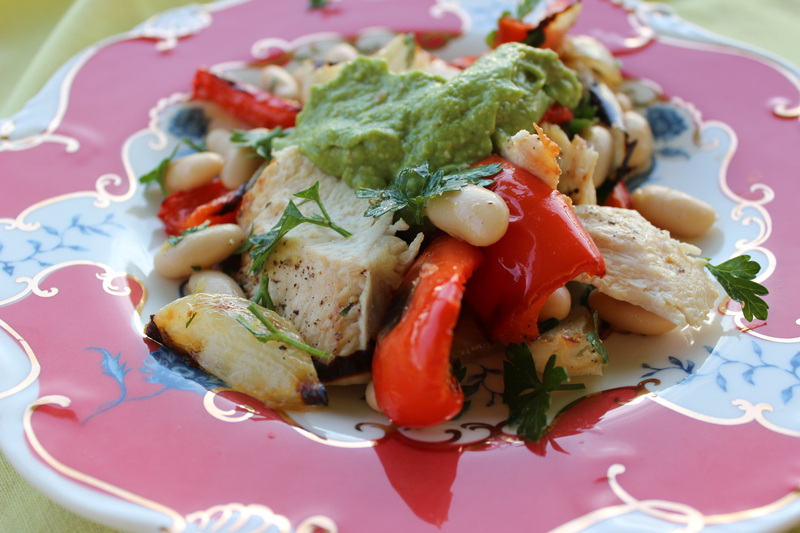 This entry was posted in Recipes and tagged avocado, basil pesto, chicken, Make ahead, roasted peppers, white beans. Bookmark the permalink. I think white beans are a totally underrated ingredient- I love to throw them in dishes like this! Thanks for sharing. I agree – they can take on almost any flavor making them so versatile and delicious!